For Week 10 of the 2018 Oregon high school football season, here's a look back at the Plays of the Day. To see complete game stories from all these contests, go to the Prep Football Tab. Barlow 28, Beaverton 24: Barlow quarterback Jaren Hunter figured he had two plays to find the end zone from 13 yards out — he only needed one. Hunter rolled to his right, buying time for his receivers to flood all corners of the end zone. 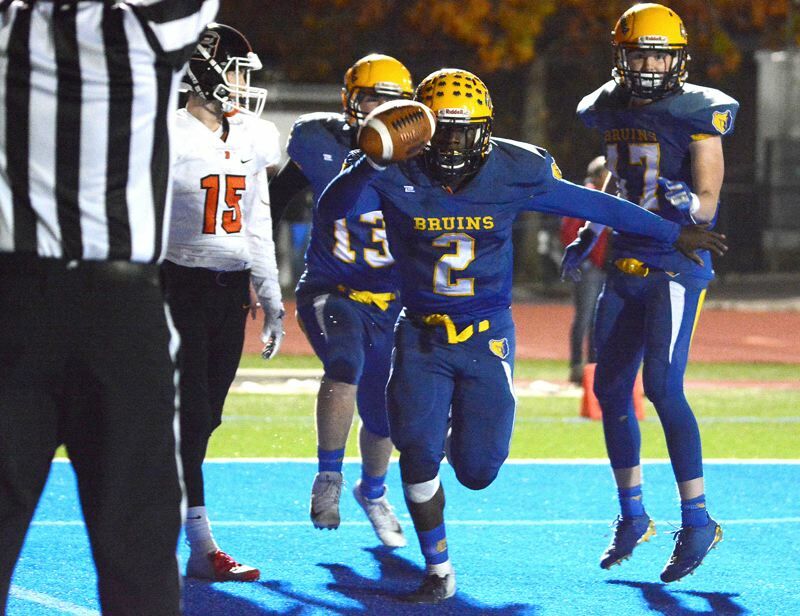 He spotted Charles Ndayizeye coming across the back of the end zone and fired a perfect pass through a crowd of Beaverton defenders. Ndayizeye secured the catch for the winning touchdown with just three seconds left in the game. Sherwood 42, Sandy 14: The Bowmen were already ahead 14-7 midway through the second quarter of Friday's Class 6A state playoff first round game at Sherwood High School. Facing a second-and-2 situation at its own 49-yard line, Sherwood gave the ball to junior running back Jamison Guerra, who cut to the right sideline, zig-zagged his way around Sandy defenders for a 51-yard TD run that upped his team's lead to 21-7. Liberty 65, Roosevelt 26: Things slowed down in the second quarter, with neither team mounting much of a charge until Liberty's Marquis Brown made what was undoubtedly the play of the game. With the Falcons facing a fourth-and-long from Roosevelt's 31-yard line, quarterback Bradley Norman rolled to his right and lofted a ball towards the pylon in the front portion of the end zone. Brown, while tightly covered, leapt over the Roosevelt defender, tipped the ball into the air, then snatched it as he fell, securing Liberty's sixth score and effectively icing what would become a blowout Falcons' win. Estacada 42 Ontario 19: After Estacada got out to a 14-0 lead, Ontario scored a pair of touchdowns in the second quarter to cut the lead to 14-12. But with two seconds left in the half, Estacada quarterback Nick Keller scored from a yard out to give the Rangers all the momentum going into the break. Clackamas 48, Newberg 0: After a slow start that included a muffed punt, Clackamas scored its first touchdown of the game on a 46-yard catch-and-run by Richard Kennewell with 3:02 left in the first quarter. Kennewell hauled it in on a seam route and sped past a pair of Newberg defensive backs to paydirt. That play opened the floodgates on a 35-point first half for the Cavaliers, who showcased their athletic superiority with myriad big plays through the air and on the ground. Lake Oswego 42, North Medford 6: Already leading 7-6, the Lake Oswego football team turned on the jets in the second quarter, scoring on each of their next three possessions in the period to rack up a 28-6 halftime lead. The first of those came at the end of a 79-yard scoring drive when senior quarterback Jackson Laurent connected with senior tight end Chris Todd for a 26-yard scoring strike at the right flag. Lakeridge 69, McNary 39: Trailing visiting McNary 13-12 midway through the first quarter, Lakeridge needed a big play to take control and got one. 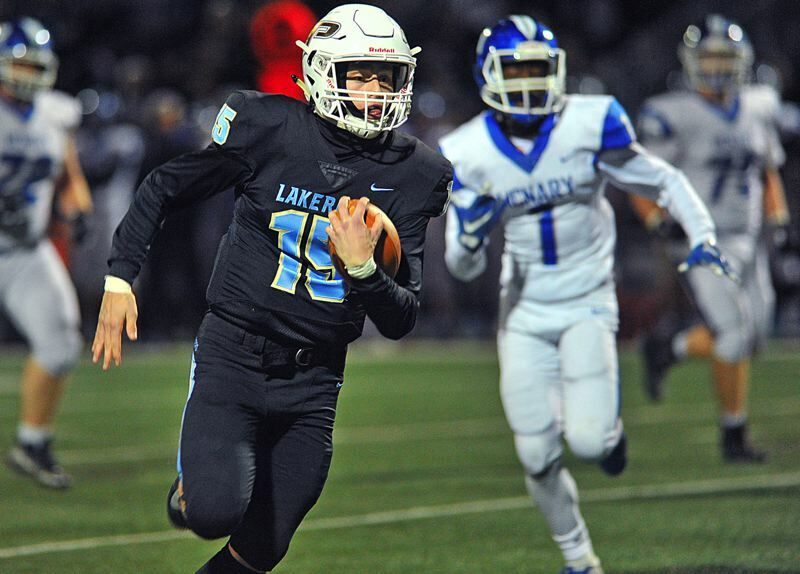 That big play came courtesy of Pacer senior quarterback Charlie Maynes, who broke free for a 45-yard touchdown run that gave his team a 19-13 lead and set the table for its eventual runaway victory at Lakeridge High School.